Mussorgsky was a member of “The Five”. a group of late 19th century Russian composers who strove to create a distinctly (nationalistic) Russian style of classical music that also included Balakirev, Borodin, César Cui, and Rimsky-Korsakov. In their compositions, these composers largely eschewed the forms and methods used by (the then-dominant 19th-century) Germanic composers in favor of music derived from Russian folk music and program music: music which describes a predetermined narrative or imagery, etc. 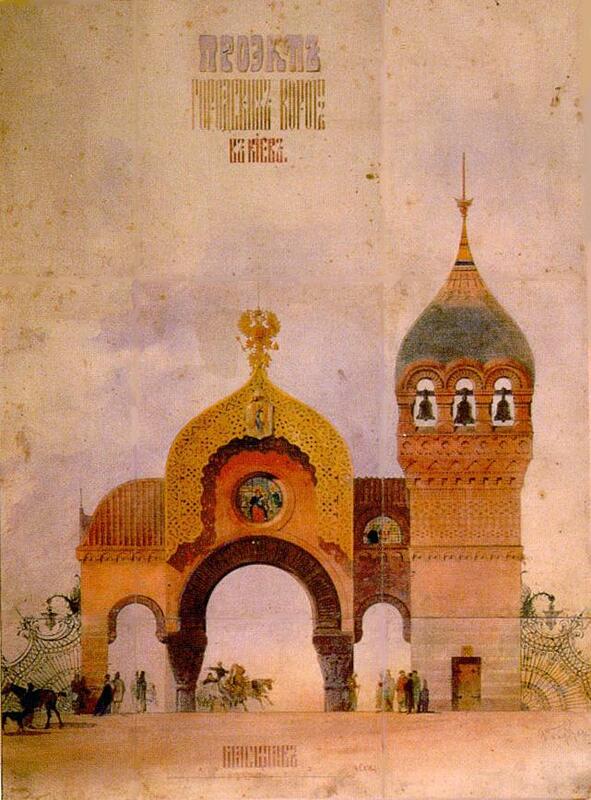 In 1874, Mussorgsky attended a memorial exhibit of watercolors, oils, architectural sketches, and costume designs by Viktor Hartmann (1834 – 1873), who had been Mussorgsky’s friend. Hartmann had died of an aneurism at the young age of 39 the previous year. 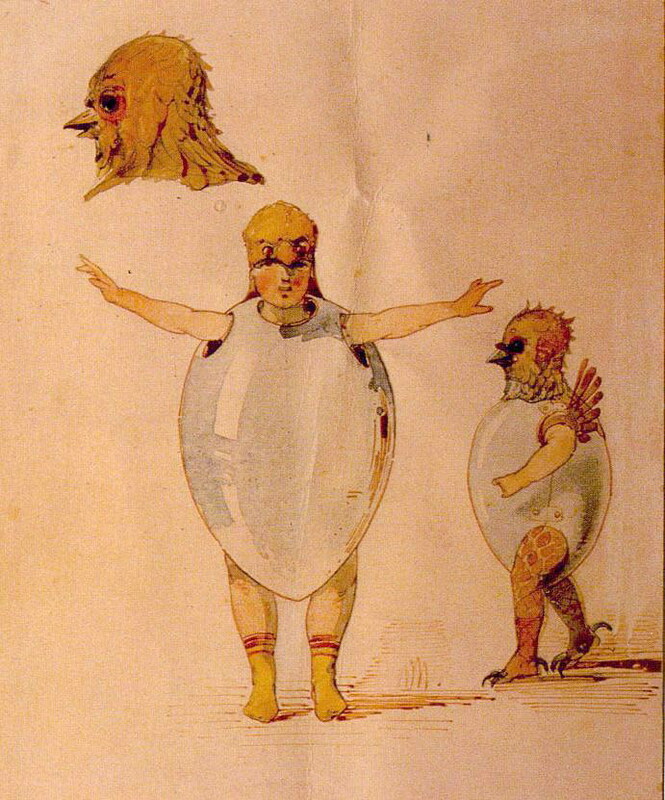 Inspired by Hartmann’s eccentric catalog of art works and apparently also deeply moved by the death of his friend, Mussorgsky composed Pictures at an Exhibition as both a memorial for Hartmann and as a sort of “meta-” program music: not only do the ten movements of the suite proper depict emotions evoked by the scene in each drawing or painting examined, but the entire work is introduced and further linked by the suite’s most recognizable theme, the Promenade, which depicts the composer (and perhaps the listener in his place?) strolling through the gallery from work to work. As the suite progresses, the Promenade theme ceases to be a separate movement but is transformed and worked into later movements (in a minor key in VIII. “Catacombs” and as a spectacular march in the triumphant, majestic finale X. The Great Gate of Kiev), suggesting a blurring of distinction between the observer of the art works and the works themselves, and ultimately portraying the observer entering into the art works and becoming a subject of their world – which perhaps, is our world after all. 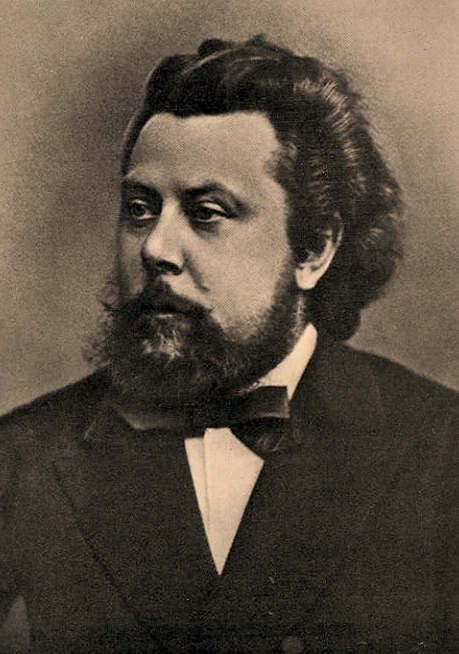 Mussorgsky performed Pictures at informal gatherings of friends, but the work remained unpublished at his death in 1881. 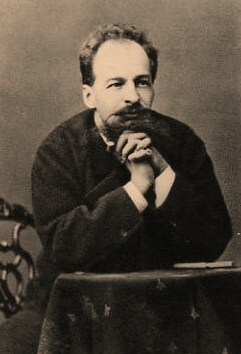 Mussorgsky’s friend and fellow “The Five” composer Nicolai Rimsky-Korsakov prepared an edition that was published in 1886, and as musicians both in Russia and abroad became familiar with the work, many observed that the work’s rich imagery, scale, and drama held great potential as the basis for a symphonic realization. To date, more than two dozen arrangements (both complete and incomplete) of Pictures at an Exhibition have been made for symphony orchestra, and more than twice that many arrangements have been made for other instruments or ensembles. But by far, the most popular and influential arrangement is the orchestration that was made by Maurice Ravel nearly fifty years after Mussorgsky composed the music. 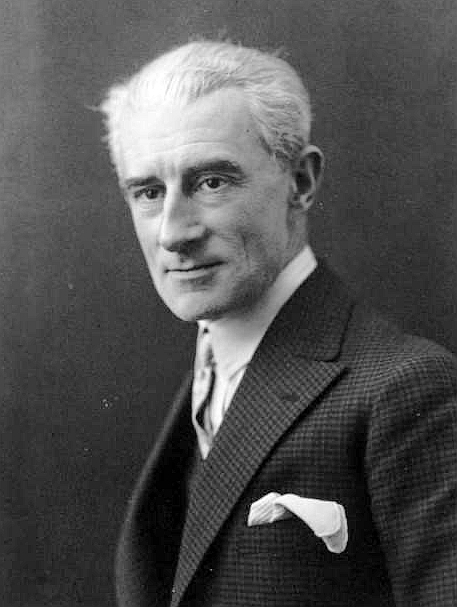 Ravel was commissioned by the Russian-born conductor Serge Koussevitsky to orchestrate Pictures and it premiered in Paris on October 19, 1922 as part of the celebrated Concerts Koussevitsky the conductor presented there from 1921-1929. Koussevitsky’s commission gave him exclusive rights to Ravel’s orchestration of Pictures for many years, and Koussevitsky himself was the first to publish it, and the first to record it – with the Boston Symphony Orchestra in 1930, for whom Koussevitsky served as music director from 1924 – 1949. 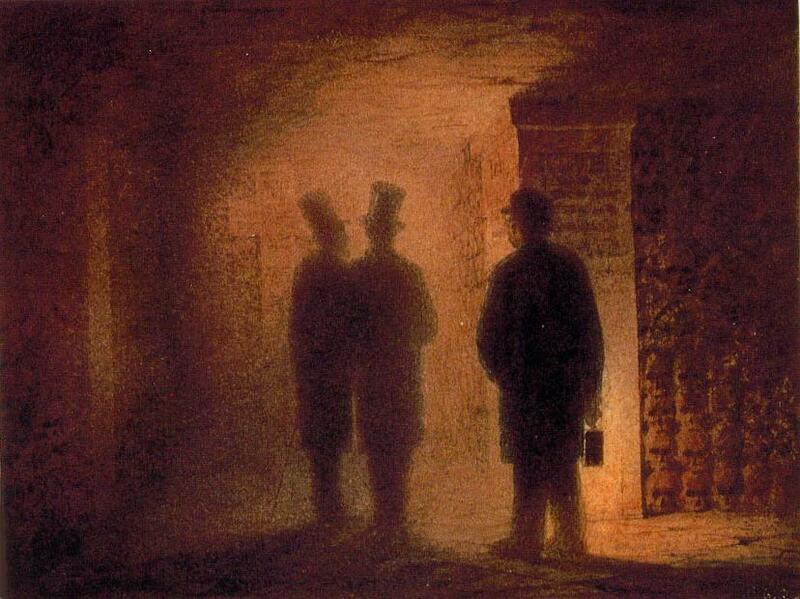 I don’t remember when I first heard Pictures at an Exhibition. Last week the Nashville Symphony performed it here at Schermerhorn Symphony Center under the direction of guest conductor Asher Fisch, and I was very fortunate to sit in the second row of Founder’s Circle (the first balcony) from which vantage I could hear every nuance with crystal clarity. I attended the (spectacular) concert with a friend who shared with me how much the work had meant to him since he first heard it as a teenager. My personal acquaintance with Pictures also dates back to my teens, but in my case it wasn’t in the form of Ravel’s glorious orchestration. Doubtless I was already familiar with some of the music from childhood, whether I heard it on the radio or in programs I attended as a young child at the Indianapolis Symphony or later at the Chicago Symphony. However, my strongest impressions of the music from Pictures at an Exhibition are from two LP recordings from the 1970s I listened to obsessively when I was in high school. The English ensemble Emerson, Lake & Palmer (ELP) was one of a small group of rock bands in the late 1960s and early 70s who sought to create a genre of rock music that was not based on blues but rather on European and classical models – these bands included Yes, Genesis, King Crimson, ELP and others and this genre was often called art rock back in the day, although it is now more often referred to as progressive rock. ELP first performed their famous arrangement of Pictures at an Exhibition at their second gig at the famous Isle of Wight Festival on August 29, 1970. 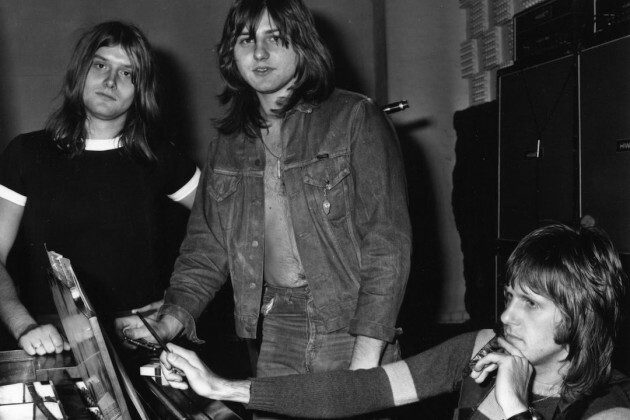 The group featured Keith Emerson on keyboards, Greg Lake on bass guitar, guitar, and vocals, and Carl Palmer on drums. The live recording of a performance of Pictures at Newcastle City Hall that the trio recorded in March 1971 and released in November, featuring Keith’s robust, high-energy – at times indeed, frenzied – keyboard playing on Hammond organ, Minimoog, and more, is the version of Pictures lodged deep in my memory. With Greg’s contributions including original lyrics set to the Promenade theme and Carl’s grand rock drumming augmented by orchestral percussion, ELP’s Pictures is several steps away from Ravel’s, but it is a powerful and rich interpretation of a classic that brought Mussorgsky’s masterpiece to millions of people, including this author. The other recording of Pictures that revolved around my turntable many times during high school was the electronic realization of the score created by the Japanese composer and arranger Isao Tomita. Tomita may be less known to audiences today, but he is one of the most influential proponents of electronic and “space” music in history, and has had a long and storied career. Pictures was his second release of arrangements of classical masterpieces for analog synthesizers released in the 1970s, following his Snowflakes Are Dancing, settings of music by Debussy. 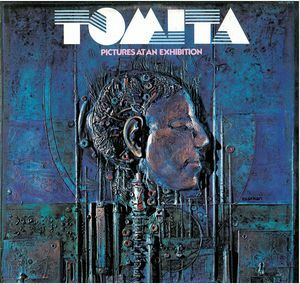 Other releases of standard classical literature interpreted on synthesizers by Tomita include music by Stravinsky, Holst, Ravel, and Grofé. Tomita’s Pictures, if anything, was much closer to Ravel’s than ELP’s, and undoubtably inspired by it. There are moments in his electronic orchestration when then textures are remarkably focused and close to that of a symphony orchestra, and other moments when the arrangement veers off in unexpected directions. Tomita especially made evocative and pioneering use of the stereo and later quadraphonic and surround sound capabilities of his audiophile followers, and his recordings are a “feast for the ears” on a sonic level as well as a musical one, with his Pictures no exception. I think what is most remarkable about a masterpiece like Pictures at an Exhibition is how resilient the composition is. In whatever interpretation one encounters it, Pictures engages the listener with an immediacy that draws one in to the heart of the work, where the lines between subject and object are not so clearly defined, and ultimately disappear altogether. By walterbitner in Music, Nashville Symphony, Orchestral, Piano & Harpsichord, Rock on February 24, 2016 .